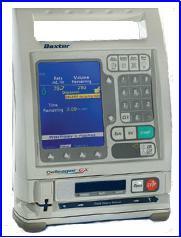 The FDA has analyzed safety information and ordered Baxter to recall approximately 200,000 Colleague Volumetric brand infusion pumps. There are serious potential defects that have gone unaddressed, and under a 2006 agreement with the FDA, if Baxter did not adequately address the concerns, the FDA could require a recall at any time. The recall was prompted because Baxter informed the FDA that they would make the next round of corrections in May, 2012 (not fast enough for the FDA, and not fast enough for customer comfort, I’m sure). Now, these devices must be recalled and destroyed. The pump is a device that delivers various fluids in a hospital, nursing home, or even home setting. According to the FDA, the Colleague-brand pump has had problems going back as far as 1999, including “battery swelling, inadvertent power off, service data errors, and other issues.” Baxter’s attempted solutions have not been successful. Baxter has been ordered to provide replacement or refund to all customers. All told, the FDA has received 56,000 adverse event reports in the past five years, and has found that the pump may be linked to over 500 deaths. Baxter has issued a press release, available on its website. However, Baxter’s website addresses problems with other pumps (and older problems with the Colleague), but does not address this situation, yet. Furthermore, we could not find any mention of the Colleague pump in the regular product line (which, is just as well, but it would be another good location to inform customers about the problems). The company gets a C-average for using social media (their website) to keep customers apprised of potentially life-threatening problems.